Human resource is the key to a nation’s development, strength, progress and prosperity. Purpose of education is to inculcate among students the ability to think and apply the knowledge they acquire in class rooms in solving social problems. This was stated by the Governor Najma Heptulla during the award ceremony of Rajkumari Sanatombi Devi Award, 2016 organised by the Managing Committee of Rajkumari Sanatombi Devi Vidyalaya, Haotal at Asha-Jina complex here today. The Governor further said that teachers as moral guardians have the responsibility of moulding the character of the students. She also emphasised that each and every one, besides teachers must take equal responsibility to inspire, encourage and support the students for definitive role in the nation’s future. The Governor lamented that the present education system produces large number of students who are not employable, which leads to frustration and social turmoil, emphasising that there is urgent need to link education with employment. Perhaps, employment holds the solution to many of the ills the society is ailing from, she added. 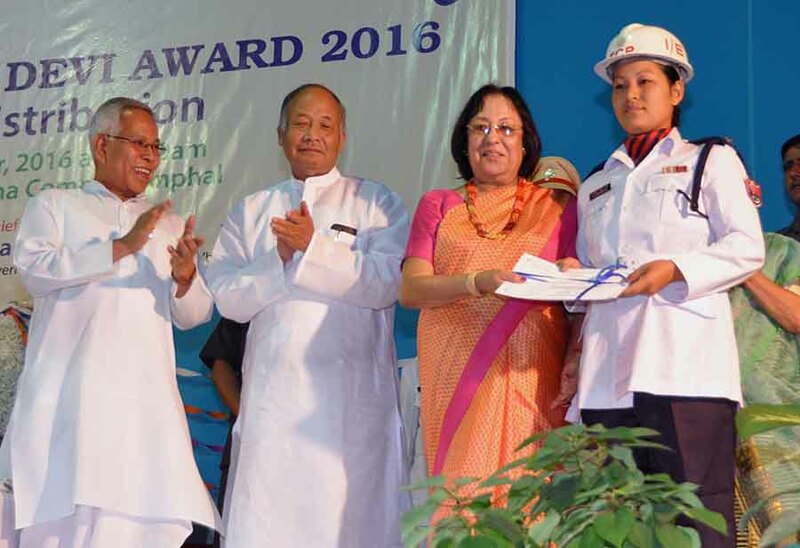 She lauded Padmashree Th Haridas Singh along with his associates in the management of RK Sanatombi Devi Vidyalaya and for contributing valuable service to the society in the field of education. Member of Parliament Th Meinya speaking as guest of honour mentioned that there are series of exams for selection of teaching faculty like NET and TET. He said that there is need to impart training to faculties to be able to guide the students in a purposeful way. Chief Minister Okram Ibobi Singh delivering the presidential speech stated that development of human resource is the most important of all sectors. He said that the central and the state government are investing huge amount of fund to develop human resource. But it is witnessed around the world that institutes which is mostly run by private entrepreneurs excel, he said and further appealed for public-private partnership in producing outstanding students. As part of the programme dignitaries presented Governor’s Award, 2016 & Rajkumari Sanatombi Devi Award, 2016 to topper of HSLC examination 2016, Sohana Laishram, outstanding teacher, Oinam Geetarani Devi, sportspersons who excelled in fencing Sagolsem Bindu Devi, mountaineering & trekking Maibam Chingkheinganba and cyclist Mayanglambam Sonali chanu, arm wrestler Sagolsem Shanti Chanu, judo player Huidrom Sunibala Devi, Traffic Police Thingujam Landhoni Devi and physically challenged person Abujam Arunkumar Meiri for producing commendable handicraft products. Later in the evening culture programmes were also presented by the students of the school.